Watermelon rind takes an unexpected starring role in this savoury soup that revels in an aromatic yet light Chinese-style broth. Wasting food really irks me. But it was not until a number of years back that I had any idea that watermelon rinds could be made useful. It was when my late grandmother mentioned making pickles out of them. That notion stuck with me years later. As time went on, I thought that I would also like to try making a savoury soup with the green rinds. And the more I pondered it, the more I imagined how good a substitute watermelon rind could be for winter melon in soup. 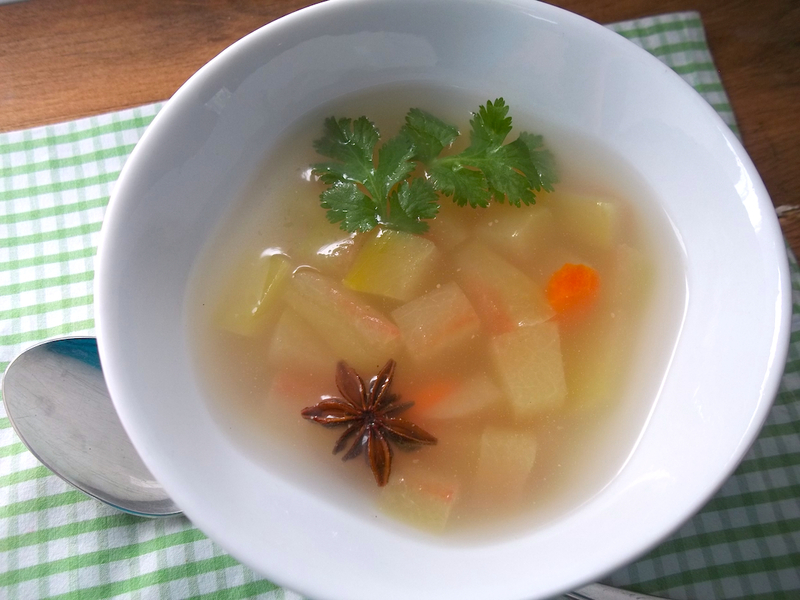 The winter melon soup I remember from China featured star anise in the broth. So I found an authentic looking recipe to adapt and used my watermelon rinds to create a one-of-kind soup that brought back delicious memories. Even if this soup doesn’t trigger such memories for you, I think you’ll enjoy making new ones with this recipe that celebrates the resourcefulness of generations past. The light and refreshing broth makes the soup wonderful for a low-calorie healthy lunch option to pair with a protein-rich salad or wrap. For a heartier soup, you can can add some cooked wild rice; and if you are a meat-eater, lamb or pork can be stewed with the other ingredients for an even richer taste. In fact, I enjoyed the meaty version with lamb for breakfast today. 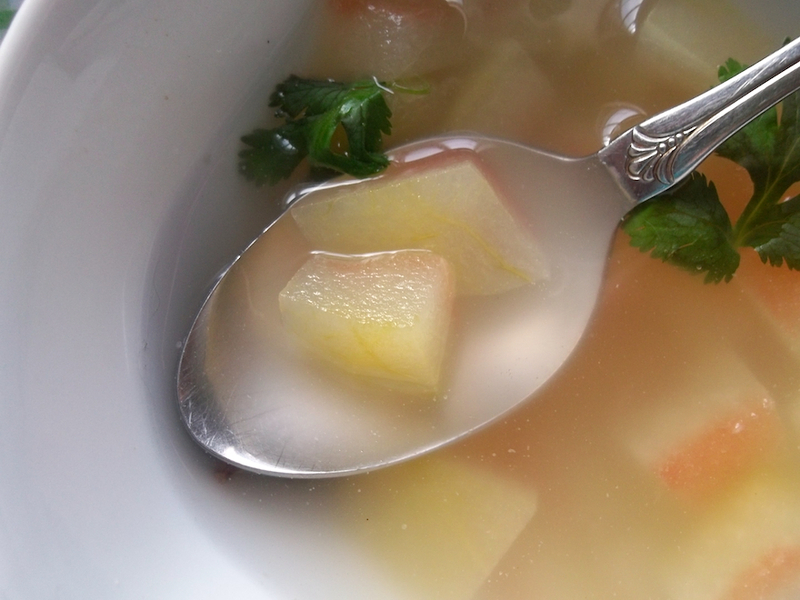 In a medium soup pot, bring broth to boil and add ginger, star anise, and watermelon rind cubes. Simmer until rind is tender, at least 20 minutes. Add carrot slices and simmer until tender, about 5 to 10 minutes. Add sea salt to taste. To serve, ladle warm soup into bowls. Garnish with springs of cilantro if desired. Adapted from Epicurious and Poor and Gluten Free. I share recipes here and at Allergy Free Wednesdays. Thanks! I never thought to use watermelon rind in anything until my grandmother mentioned it. I love the idea of making soup with watermelon rind. 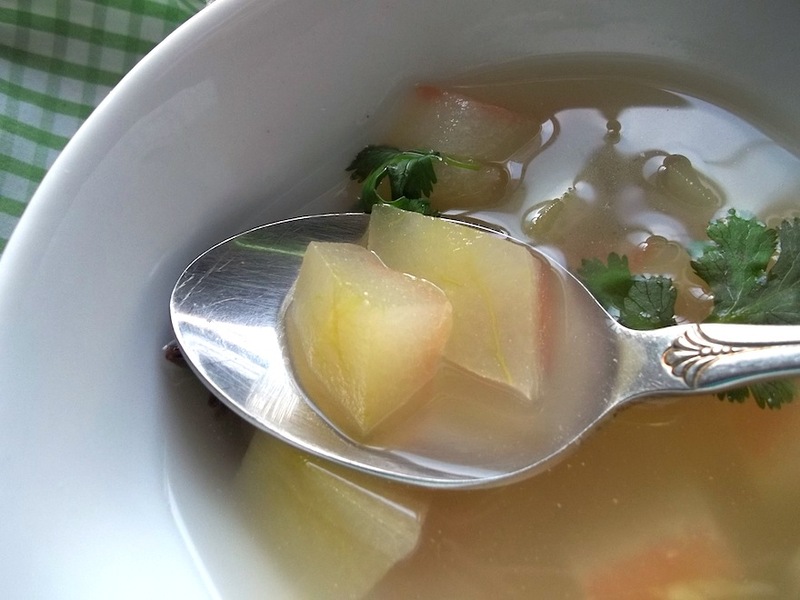 We had winter melon soup a lot when we were younger and swapping it out with watermelon is such a great idea! Can’t wait to give this a try! Thanks! I love adding ginger to soups. Pingback: Vegetarian, Gluten-Free Roundup: Trifle or Tartlets?